Want to learn more about Microsoft's latest server OS? This guide has you covered. Here you'll find tips, videos and expert advice on all things Windows Server 2008 R2. operating system. Overflowing with new features like BranchCache and DirectAccess and improved functionality for Active Directory and Terminal Services, Microsoft's latest OS has plenty to offer. But how do you decide if Windows Server 2008 R2 is worth the upgrade -- and where do you start? This learning guide breaks down the key components of Windows Server 2008 R2. From new features to advice on installations, you'll find articles, tips and videos on all things R2. Scroll down below to learn about key file management improvements, live migration for Hyper-V, new security tools and much more. There's been a lot of buzz about Windows Server 2008 R2, and it can be hard to narrow down what's truly important. This section breaks down the basics of the operating system and provides the essential information you need to know before upgrading. What exactly is Windows Server 2008 R2? Confused about what this "R2" business is really all about? Not to worry. You'll find answers to some of the most common questions surrounding Microsoft's latest OS in this FAQ. Unlike with Windows Server 2003 R2, this new OS includes some core kernel changes and improvements to common management tools that collectively make it a much different release. We spoke with Microsoft's David Lowe when R2 was still in development to find out what's changed in the areas of Active Directory and failover clustering. Click play to hear the affect user feedback had on certain Windows Server 2008 R2 improvements. Since Windows Server 2008 R2 is the first Microsoft server OS that is available only as 64-bit, it may require new hardware, so organizations should be prepared before migrating. Windows Server 2008 R2 is gaining momentum but eight years after its introduction many IT shops still depend on Windows Server 2003 to run their mission-critical applications. You might have heard about upgrades to Active Directory, Terminal Services and Hyper-V getting a lot of attention with Windows Server 2008 R2. Here you'll find out what else IT managers are excited about. Having trouble figuring out which R2 features are worth your time? Check out our slideshow of the most significant improvements. Often times it's the little things that count. Here is a rundown of the smaller changes to R2 that may have fallen under the radar initially, but could have a major impact on your migration plans. Improving the efficiency of your server's power usage is good for the environment -- and the bottom line. Learn how migrating to R2 can reduce power consumption on your machines. Microsoft has addressed certain scalability problems in DFS that have remained constant through the years, including issues with file replication. Minor improvements could make a big difference with the latest version of Internet Information Services. Find out what's new for IIS 7.5 with Windows Server 2008 R2. 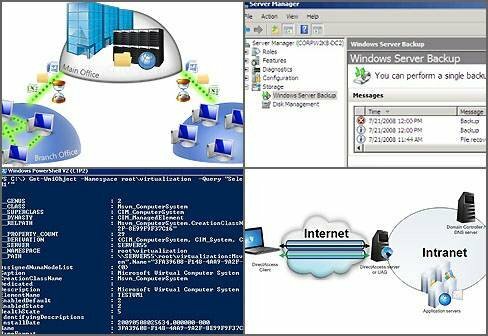 Windows Server 2008 R2 and Microsoft's latest desktop operating system, Windows 7, are very much intertwined, and several of the best features in each are only available if an enterprise runs both together. In this section, find out how the two OSes rely on and influence each other. In this edition of The Windows Report, Greg Shields explores how enthusiasm over Windows 7 could speed up Windows Server 2008 R2 deployments. Check out the features that require both platforms to function, and learn what they can offer your environment. Better remote office performance could make Windows 2008 R2's BranchCache feature just another reason to speed up your Windows 7 migration plans. DirectAccess has the potential to change the way admins manage remote computers. But is it really secure? Connection drops are a fact of life for on-the-road workers, but VPN Reconnect simplifies the process of reestablishing a connection. Microsoft took some major steps forward in the virtualization market with Windows Server 2008 R2. This section explores the changes to its hypervisors technology, Hyper-V R2, as well as Terminal Services, now renamed Remote Desktop Services. Live Migration may be the most talked about Hyper-V R2 feature, but it's far from the only change. See what else had been added with Windows Server 2008 R2. Storage improvements in Hyper-V R2, including Cluster Shared Volumes (CSVs) and the addition of dynamic storage, may increase the hypervisor's popularity. Of course, there's plenty more to discuss involving Hyper-V for Windows Server 2008 R2. This guide has all the details. Terminal Services in Windows 2008 R2 comes with a brand new name and enhanced functionality such as Remote Desktop Virtualization and fair share CPU scheduling. Many IT pros were more excited about the Active Directory (AD) enhancements than any other improvements in Windows Server 2008 R2. This section explores the key changes made to AD this time around. From the ADAC to managed service accounts, Active Directory in Windows 2008 R2 has several new capabilities. But which ones are worth checking out? Are R2's AD enhancements even better than Hyper-V with live migration? Some IT pros think so. Find out which Active Directory features are causing a stir. Video: Will AD have your back in R2? The Recycle Bin is arguably the most talked about new feature for AD. Microsoft MVP Gary Olsen calls in to discuss the implications for backup and recovery. → More on the Recycle Bin: Will it live up to the hype? Windows Server 2008 R2 builds on many of the Group Policy improvements that were found in Microsoft's previous server OS. Get the details on PowerShell cmdlets and other new features. Active Directory also saw a lot of moving parts with Windows Server 2008 R1. Check out the major improvements made to AD in the original release. Every Windows release is described as "the most secure OS yet." Find out how Windows Server 2008 R2 measure up to normal security standards and learn about new security tools in this section. The results are in. See if initial tests find Windows Server 2008 R2 safer out-of-the-box than its predecessors. While most IT security software goes to work after an infection has been identified, new technology in Windows Server 2008 R2 allows for a more proactive approach. Wait, isn't this a Windows 7 feature? Sure, but Microsoft's BitLocker To Go technology in Windows Server 2008 R2 is also a good fit for protecting branch office servers. Check out the other security updates that were originally included with Windows Server 2008 R1. Can 16-bit apps survive Windows Server 2008 end of life? Revisiting DCPromo in Active Directory: what's changed?